If you talk to Japanophiles about their eating adventures, they won’t just tell you about rollicking izakayas and exceptional sushi. They’ll also talk about getting lost while looking for restaurants. Peering into Tokyo stairwells on hushed suburban streets, becoming dizzy while doing laps of a Kyoto alley, feeling alarmingly placeless in nondescript lifts: these are key Japanese dining experiences too. Kaiseki is a venerated style of Japanese dining that’s not much seen in Melbourne. There are various strands but all rely on a formal progression of seasonal dishes. In the same way that a symphony moves from sonata to adagio to minuet and so on, a kaiseki meal is a progression from raw to soupy to grilled to simmered. And, just like a symphony, the chef-composer may divert and dally. Intricate carving, artful jellies, elaborate garnishes and delicate plateware are key kaiseki projects and a big part of Ishizuka. 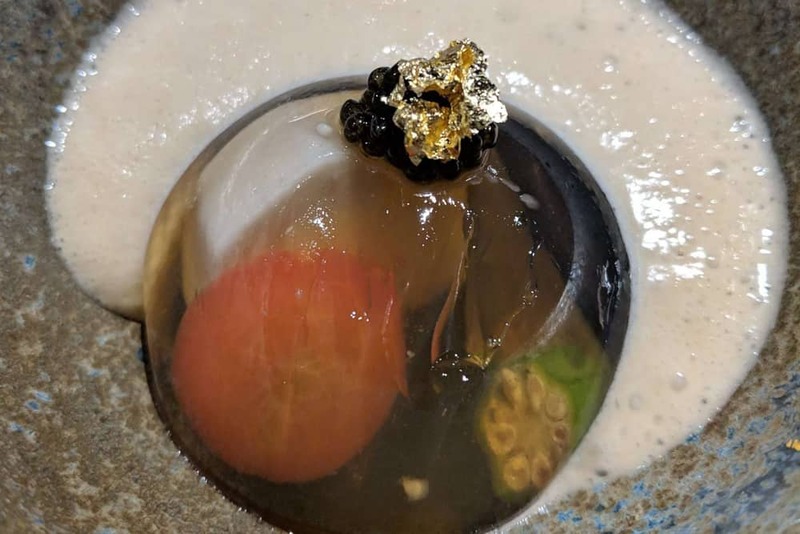 My 11-course meal starts with a tiny sphere of bonito jelly enclosing jewel-like vegetables. The arrangement has the startling beauty of a coral reef; it’s topped with caviar and gold leaf in case I didn’t already realise it was special. Next, zensai, a tray of miniature masterpieces, including poached daikon topped with foie gras, and a sliver of lime skin piled with caviar and dotted with black sesame seeds so it looks like a teeny wedge of watermelon. The sashimi course is primped with the care that a Hollywood star reserves for Oscar night. It’s also renamed ‘otsukuri’ because the word has more genteel connotations than ‘sashimi’ which means ‘pierce’ or ‘stab’. 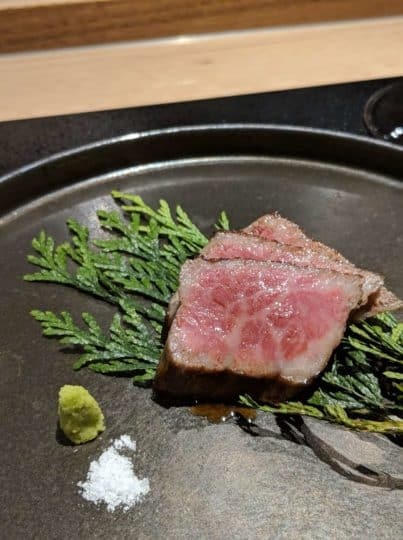 Outrageously rich and wonderful wagyu beef is judiciously grilled and served with a choice of five salts. 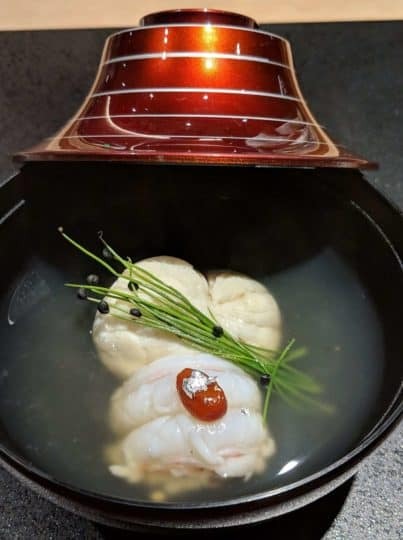 Nimono – the simmered dish – showcases different ingredients (octopus, duck breast, prawn, green beans) simmered separately in broths that contain various carefully judged ratios of soy, mirin and sake. Honestly, I feel like this dish went over my head, or around the side of my taste buds, but I did appreciate that the beans were polished to make them more tender. Kaiseki can be a bit like this: If you’re not a supertaster, its successes can remain hidden inside its intricacies. There’s no denying that Ishizuka offers a compelling rendition of a time-honoured yet always expressive cuisine; the nimble drinks offering is one example of its contemporary flair. Such careful beauty can inspire hushed awe rather than burbling enjoyment but if you pierce the silence that can subdue this basement bunker, the staff are well-informed, chatty and happy to unlock the mysteries of their masterworks.